The holidays are different for adults than they are for kids. You can still have a great season, but cut the holiday hijinks. As a kid, the holidays are a time of fun. After all, you get presents, candy, and time off school. Holiday hijinks are a part of growing up. Adults, though, need to learn how to change their view of the holidays. The things that were funny when you’re a kid are no longer in force. Plus no one thinks it’s fun to buy you presents anymore. You can still enjoy the holiday season as an adult, but you do need to adjust your expectations. Use our Do Nows to help you evaluate what you want out of the holidays, as well as learn strategies for putting together a budget-friendly gift exchange. Just because we’re asked to find the child within during the holidays doesn’t mean you should act like a child. 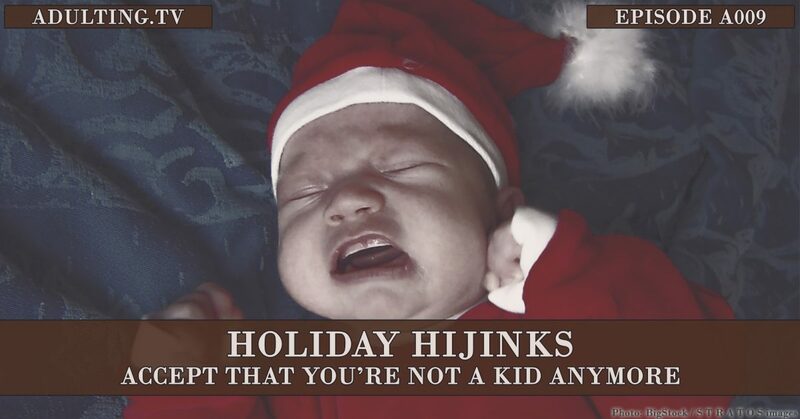 What are some of the holiday hijinks you should avoid as an adult? What are some of the things adults are expected to do during the holidays? How to handle gift exchanges with family and with coworkers. Why it’s important to determine what the holidays mean to you so you can set boundaries.